I used loose leaf tea, blue tissue paper, pen, acrylic paint, a key, marker, and paper. There are always new doors to open. I like the idea that even though you feel like you’re stuck somewhere in your life, you can always find a key to the door you want. It might not always be easy or within reach, but it’s attainable. I love texture, and red represents passion, energy, and love. I love running my hand across a painting…because you’re not allowed to at galleries! 🙂 I encourage anyone who sees my art to feel the texture, because that plays a whole new role into the meaning of a painting. 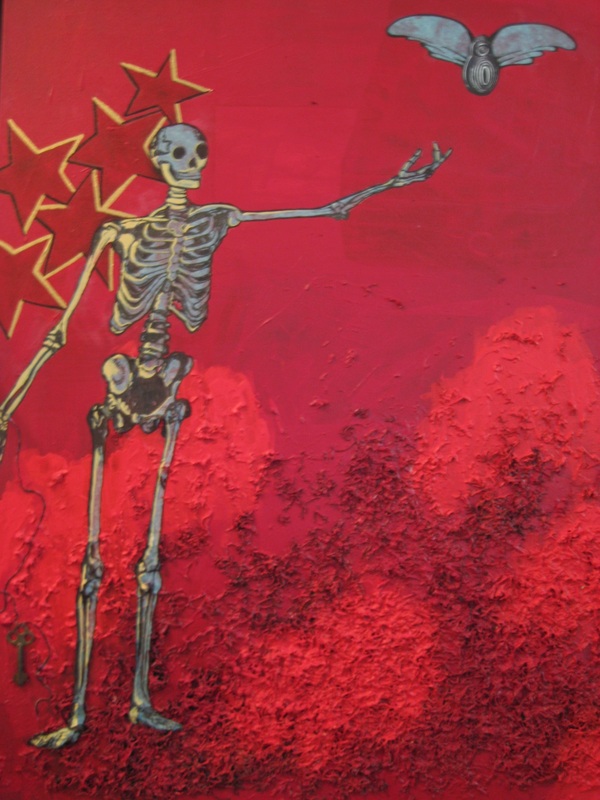 This entry was posted in Uncategorized and tagged door, key, loose leaf tea, painting, red, skeleton, texture, tissue paper. Bookmark the permalink. I love how you use texture! I have always thought it was very unique and innovative. I also love how you desire to redefine what art is, how people experience art, seeing it, touching it, really experiencing it. Art is more than just for your eyes, so why not right?